Google Home Max is a powerful speaker and home assistant in one package. Impressive components, auto-equalization, and access to 40 million songs via streaming services makes it ideal for music lovers. The built-in home assistant also allows you to control your smart home and have your day run more smoothly. This is the perfect smart speaker for music lovers who are ready to start their connected home. The Google Home Max gives you access to over 40 million songs via various streaming services, while also giving you access to your own local music via Bluetooth and AUX port. The built-in home assistant lets you do things like get up-to-date traffic information, hear the latest news, and order things online - all via voice command. Serious power: The Google Home Max has made it clear that Google is to be taken seriously on the speaker market. This smart speaker has dual 4.5-inch woofers for deep bass and customized tweeters for clear and pleasant highs. An acoustically transparent fabric mesh keeps playback smooth. The future of sound: Google Home Max uses machine learning to adjust the equalizer settings to the speaker's surroundings. EQ settings are readjusted each time you move the speaker, giving you crystal clear sound no matter where you place it. Make life easier: The voice-activated assistant is designed to make your home life easier. All you have to say is "Ok Google" to get accurate traffic information, the latest news or see what's on today's schedule. You can even use Google Home Max to order everyday essential from stores such as Target and Walgreens. Music lovers rejoice: Stream music from popular services such as Spotify and Pandora or listen to your local music library via Bluetooth or AUX cable. You can even ask the Google Assistant to play a specific song for you over Spotify (with a Spotify Premium subscription). The Google Home App: In the app, you can see all music and entertainment services available, as well as view a breakdown of all voice-commands and features. The latest iteration of the Google Home gives you a breathtaking music-listening experience and a convenient home-assistant in one package. Powerful components and smart software combine to make the Google Home Max a speaker that simply outclasses the competition. The Home Assistant can be used to control your smart home, access music & entertainment, and get the latest information from the largest database on the planet. How does 'Smart Sound' work? The walls and objects placed around a speaker amplify the bass frequencies of the audio being played, resulting in bass-saturated sound with indistinguishable highs. To counteract this effect, the Google Home Max is equipped with 6 microphones which measure the acoustics of a room. It then uses machine learning to adjust the equalizer settings, balancing out any possible bass-amplifying effect. It does this automatically every time you move the speaker, so you'll have the best sound quality possible throughout your entire home. The Google Home products work particularly well with the Google Chromecast. The Chromecast is a device which turns any conventional TV into a Smart TV. Using the Google Home Max together with the Chromecast allows you to ask the Google Assistant to play particular content from streaming services such as Netflix, HBO Now and CBS using only your voice. All you need to do is plug it in and download the Google Home app to get started. You'll then be taken step-by-step through the process and given a few voice-commands to try out. Two 4.5 inch woofers and two custom tweeters deliver awesome sound quality. 6 built-in microphones auto adjust EQ settings to fit the speaker's surroundings. You can see all the music, entertainment and shopping services available in the Google Home App. You can also see an overview of all voice-commands available and get tips on how to use the device. The Google Home Max is a powerful speaker with access to a wide-ranging music library via services like Spotify. You can also use it to plan your day and control your smart home. Connects directly to Wi-Fi. You can play music from your local devices using Bluetooth. Far-field voice recognition lets you use the home assistant even if you play music loudly. The speaker has the same soft look as the other Google Home products. The white plastic cover and grey mesh material look great in every room you place it in. You need to say "Ok Google" or "Hey Google" in order for the speaker to hear your commands. It otherwise can't listen to what's being said. You can mute the microphone completely at any time. A terrific device for music lovers looking for a powerful speaker who want to stream from services such as Spotify and Pandora. Also great for owners of any of the Chromecast devices. 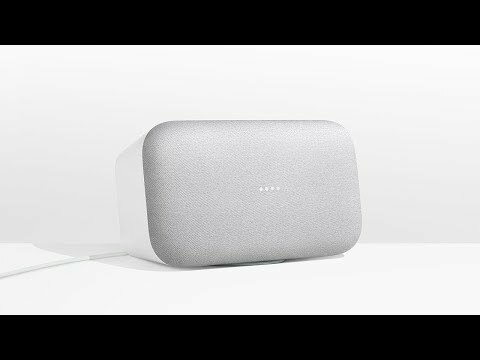 Google Home Max: 13.2 x 7.4 x 6.0 in. What music streaming services is the Google Home Max compatible with? Which smart home manufacturers is the Google Home Max compatible with? What shopping services can I access using the Google Home Max? What operating system does the Google Home App support? To use the Google Home app, you'll need either an Android device (with Android 4.4 or higher) or an iOS device (with iOS 10 or higher).